While the roof was red at the time of Washington’s death, the shingles were not always that color, just one example of the story that the roof has to tell. Wood was the overwhelming choice for Virginia roofs in Washington's day. Washington purchased hundreds of thousands of shingles for Mount Vernon during his lifetime, most of them split from cypress trees cut in the Dismal Swamp of southern Virginia. Cypress is naturally rot resistant, and an old growth cypress roof was expected to provide cover for 50 years or more. Besides choosing one of the best woods for his shingles, Washington also knew the importance of shingle care. Sun and rain gave roofs a beating, and the practice of painting roofs with tar or oil-based paints was an attempt to extend the life of shingles by sealing them and replacing their natural oils. 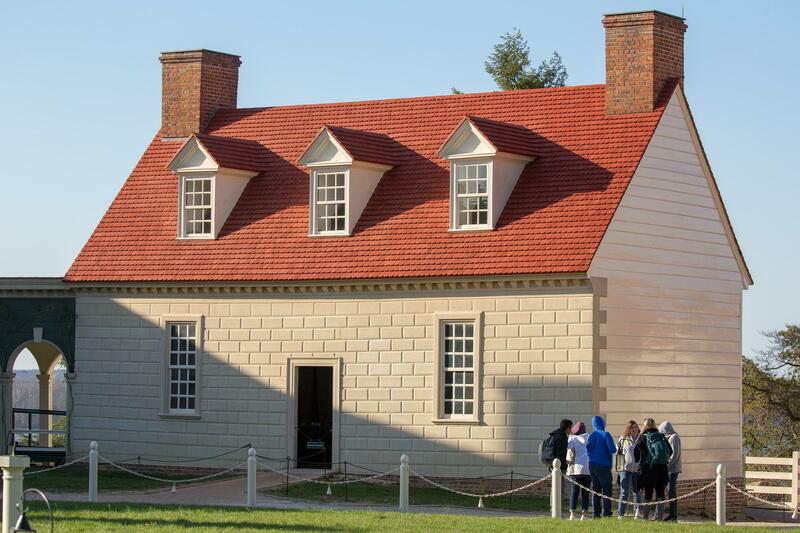 The red color used on Mount Vernon's roofs today was matched to the paint preserved on an original shingle found in the mansion attic, apparently dropped during shingle replacement in the 1800s. The West Front of Mount Vernon by Edward Savage, c.1787-1792, MVLA. This red color was on the mansion roof by 1793 when Edward Savage executed his two views of Mount Vernon. The paintings also show that, at that time, some of the outbuilding roofs were painted a slate blue color, and we have found early shingles on-site that preserve that color, too. Washington ordered in letters in late-1792 and early-1793 that the outbuilding roofs be painted red. In one letter, he states that it was the higher cost of the white lead pigment needed to make the slate color that was the cause of the switch from blue to red roofs. What was only recently learned was that the Mansion roof was also painted this slate blue. In 2015, architecture staff found shingles that had been removed and dropped into the roof when the piazza was being constructed in 1778. These encapsulated shingles were painted slate blue, indicating that the roof was likely this color from as early as 1775. An artist rendering of the Mansion with a slate blue roof compared to the red roof. Work on the Stable, 2015, MVLA. Recently painted Kitchen, 2018, MVLA. 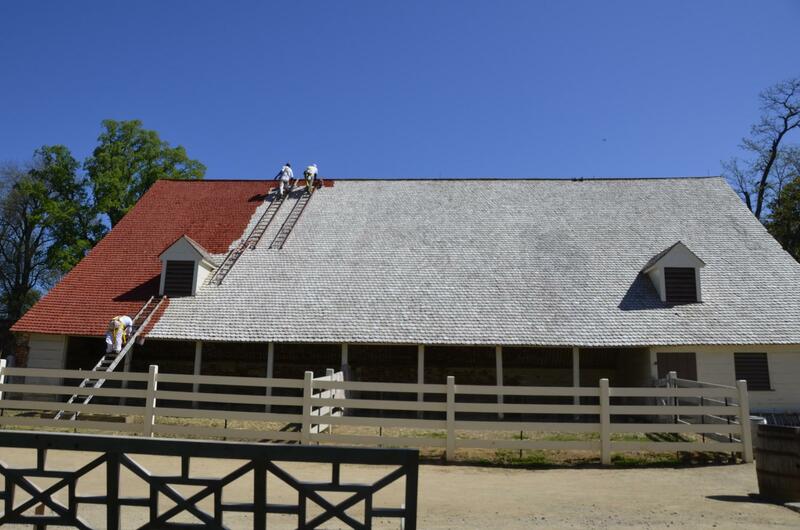 At Mount Vernon, we continue traditional roofing practices. Over the years, wood choices might have varied due to availability, and paint types may have changed with new innovations, but painted wood roofs have been in place at Washington's home for almost 300 years. 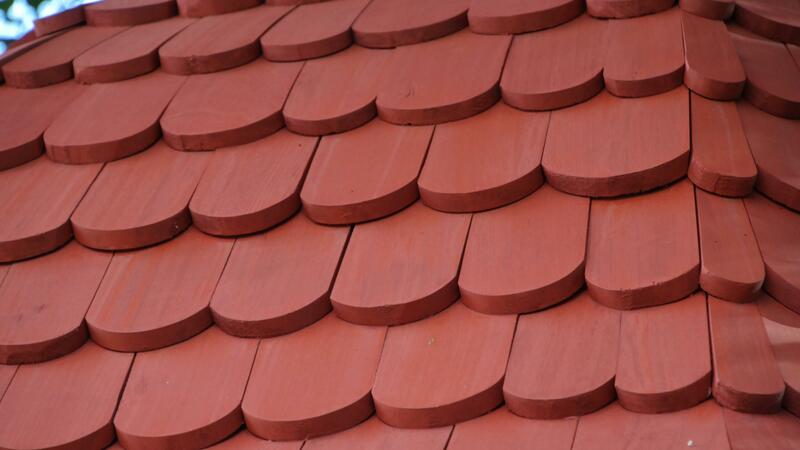 It is natural that all roofs eventually come to the end of their useful lives and need replacement. Over the last three decades, the Preservation Department has looked at these moments as opportunities to return more and more to the materials and techniques known to Washington. In 1996, the Mansion roof was replaced with shingles, hand-split from old-growth cypress logs that had sunk more than a century ago in the swamps of Florida. Similarly, the outbuilding roofs have been replaced with old-growth cypress as they have worn out over the last decade. Having gone to such lengths to use the same type and quality wood as Washington did, it was decided to give the same thoughtful attention to the paint that helps extend the life of our roofs. 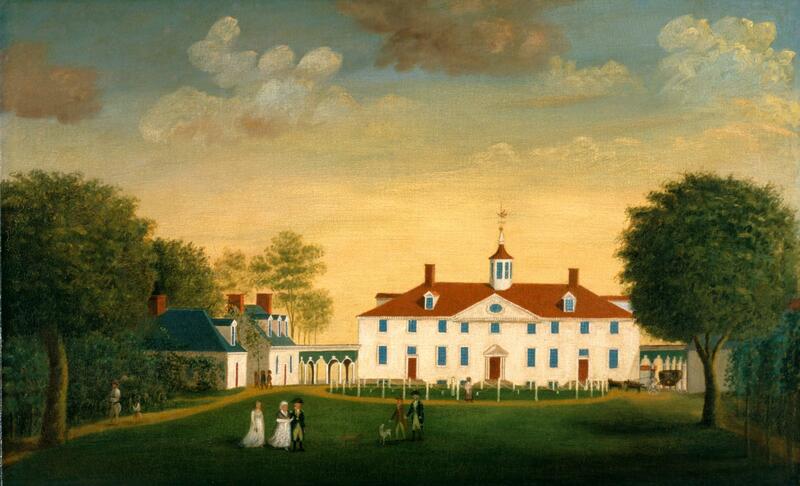 At some time in the past, Mount Vernon began using modern paints to achieve its trademark red roofs. Unfortunately, the paint chosen was not robust enough to withstand the harsh effects of weather and sun that a roof paint endures, and the paint began visibly failing within a few years of application, requiring frequent stripping and repainting. In the 18th century, roofs were frequently coated with paints that used linseed oil to bind together the pigments; currently, no such commercially-available linseed oil paints are appropriate to our needs. As a result, experiments with several formulas were conducted and a commercially-available, oil-based stain that is extremely close to the traditional 18th-century, linseed-oil paint was selected. The full application process is multiyear: two coats in year one, and two coats in year two, for a total of four coats. This stain does not sit on the surface of the shingle, but rather is absorbed, and therefore does not ever peel or require stripping. When the color begins to fade, a new application is made directly over the prior one. Paint analysis combines a microscopic examination of paint samples and document-based research. 1. GW to William Hamilton, April 6, 1784; GW to GAW, August 12, 1787. Thomas Reinhart, 2015 Roof Painting Project, February 23, 2015 and April 19, 2018. Susan L. Buck, Cross-section Paint Microscopy Report, 1777 Single Paints, January 29, 2016.